In celebration of reaching 1,000 patrons, we bring you this bonus review – go to Patreon.com/POSTwrestling to download OR check your podcast app if you have subscribed to the RSS feed provided to all members. 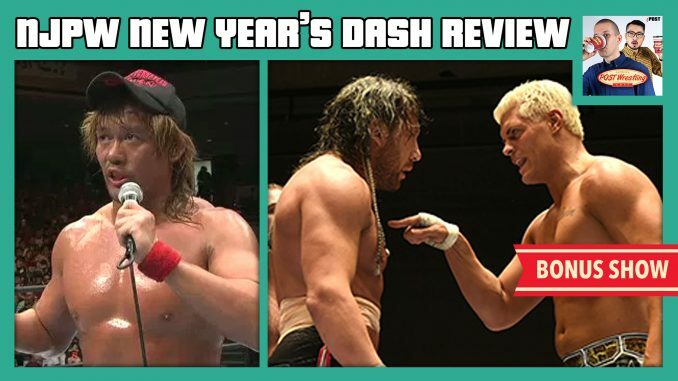 John Pollock and Wai Ting review NJPW New Year’s Dash 2017 from Korakuen Hall featuring all the fallout from Wrestle Kingdom 12 and new storylines set-up heading into 2018. Tensions arise between The Bullet Club’s Kenny Omega and Cody Rhodes, Tetsuya Naito receives his next opponent and Minoru Suzuki seeks redemption for his embarrassment suffered at WK12. Support any tier of the POST Wrestling Café Patreon to listen to this show in your custom RSS feed.